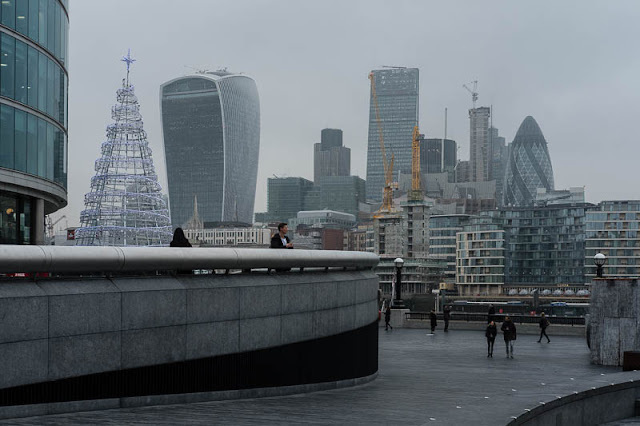 The Christmas tree by city hall twinkling in the grey surroundings. It does look very grey so some sparkle is welcome. I'm not keen on these modern tree things really but I suppose they are a lot less hassle. I love this photo! It made me smile! A good angle for this shot Mo. The grey days are so depressing! That is a good perspective for the shot. Gotta tell you . . . I really can't stand that drunken skyscraper to the right of the Christmas tree. I worry that London's wonderful skyline is in danger of becoming uninteresting because of poor controls over the new additions.